We have more than 400 from which to choose! Recently, Texas and other states were found to be in violation of certain provisions of the Individuals with Disabilities Education Act (IDEA). Our Task Box products can help your district meet many of the requirements of the I.D.E.A. Each task is designed for a particular ability level (beginner, intermediate, or advanced), but can be easily modified and/or extended for flexibility. Our Scaffolding Training Manual (free download) shows how our products are designed to work together to provide a smooth learning path from the simplest basic skill to the higher level vocational skills. Basic Skills tasks focus on Fine Motor, Matching, Put-In/On, Sorting, and Stacking. Pre-Vocational Skills tasks focus on Assembly, Job Training, and Packaging. Transitional Skills tasks help students transition from the classroom to more independent functioning in the outside world. Vocational Training Tasks (as opposed to Pre-Vocational) are larger scale products designed for multiple students or provide additional time on task for a single student. Sometimes referred to as "work boxes," "work tasks," "task boxes," or even "work task boxes," our Hands-On Tasks utilize the principles of structured teaching developed by TEACCH. 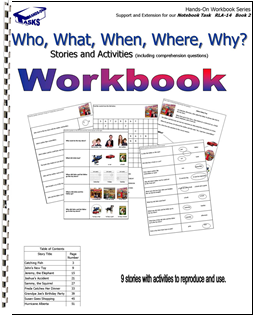 Introducing our new series of Workbook Tasks™! 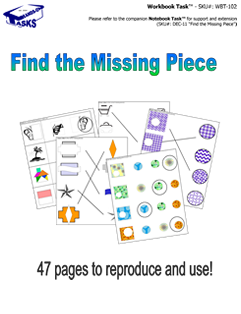 These 40-50 page reproducible workbooks are the first of a new series of reproducible workbooks sold only at www.handsontasks.com. You may download the .pdf version for $4.95 or order the printed version at an introductory price of $19.95 ea. (postage included). Modified pencil-paper worksheets - Workbooks are specially designed for students who benefit from modified pencil-paper work. Students either “draw a line to” or “circle” the correct answer. Require no handwriting - Our Workbook Tasks™ have similar content and format of many workbooks already available, but require no handwriting. Designed with high resolution graphics and photographs. Easy to reproduce - printed Workbook Tasks™ are comb-bound for easy reproduction. Five dry erase sleeves are included with the purchase of each printed copy. 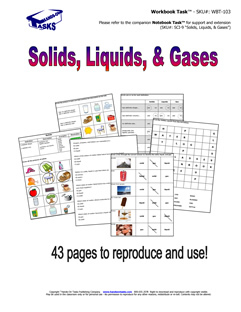 Ideal for inclusion time, resource, ESL, and as an extension for their companion Notebook Task™ (available separately here). Categories will include: Reading and Language Arts, Beginning Math, Intermediate Math, Phonics, Science, Social Studies, History, and Decision Making.